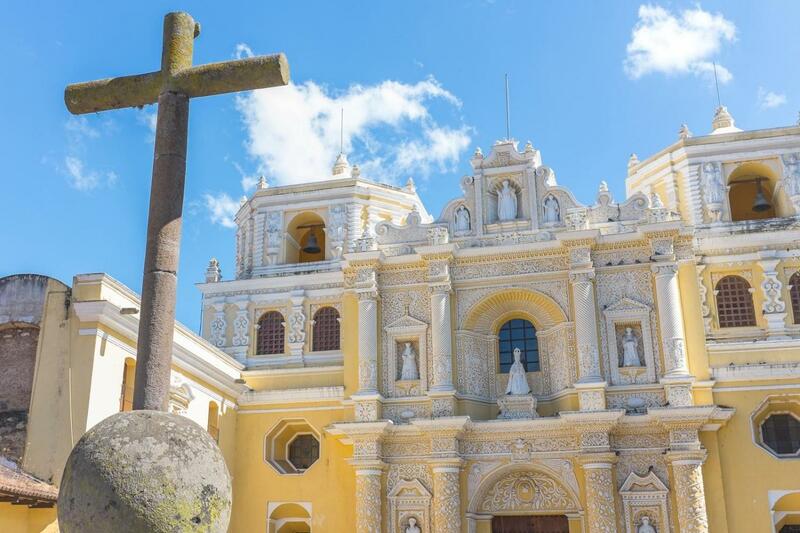 You will be picked up at your hotel in Guatemala City and transfer to Antigua Guatemala to meet your local guide to begin your soft walking of approximately 3 hours below a brief summary of what to expect on your way. We start at La Merced Church, temple of Guatemalan Ultrabaroque style that has two bell towers. On its upper part of the facade is a sculpture of San Pedro Nolasco, founder of the Mercedarian Order. Continue to Santa Catalina Arch, built to connect the nuns between cloisters to avoid being seen due to the votes that the religious who belonged to that Order took. After the earthquakes of 1773, the arch became important due to the arrangements that were made, included the construction of a turret and the inclusion of a Lamy Amp Lacroix watch of French origin. We move to the Central Park is located at the heart of the city, surrounded by the traditional grid pattern frequently utilized in Spanish urban planning during the colony. The park is surrounded by the Palace of the Captain Generals, the City Hall, the church of San José and the Portal of Commerce (or the Bakers’ Portal). Here, visitors will also find Las Sirenas Fountain, which has a oral tradition where the Count of Gomera ordered to build the fountain in memory of his daughters, who in giving birth did not want to breastfeed their children for what the count ordered To tie his daughters to a trunk in the center of a waterhole, where they died of thirst and hunger. Time for lunch (Not Included). Transfer to Guatemala City to start our sightseeing tour through the city. First we will visit Las Americas avenue that is a road in its central garden has several Plazas and monuments in honor of the countries of the American continent. Continue to Berlin Plaza there are three pieces of concrete brought from Germany, these are original sections of the Berlin Wall and from here you can view part of the city and the landscape of the volcanoes. La Reforma It was built inspired by the avenues of France for this reason various statues carved in stone, bronze and marble were brought from Italy. Yurrita Church It is a private chapel of mixed Baroque style, with Romanesque and Byzantine elements. The church was built as a votive offering by Felipe Yurrita, a native of Arevalo, Castilla, Spain, to the Virgin of Our Lady of Sorrows, patron of that town, for favors received. The Civic Center of the City, we will see a set of buildings constructed between the 50’s and 60’s: The Supreme Court of Justice, the Ministry of Public Finance, City Hall, the Social Security, the Bank of Guatemala, the National Mortgage Bank, and the Guatemalan Tourism Commission. Arrive at the Major Plaza of the Constitution. This Plaza is the heart of the Historic Center of the city. It is surrounded by important monuments such as the National, the Metropolitan Cathedral, the Portal of Commerce and Centenarian Park. Finally, we will visit the Central Market, which is located behind the Metropolitan Cathedral, in the basement of the Tabernacle Plaza. It is divided by different sectors of products, where you will find from spices to beautiful memories of jade made in Guatemala. Ending the tour, we return you to your hotel at Guatemala City.